It looked like a hellish traffic accident, with a mangled victim who wouldn't recover much more than the insurance policy's limits. But then, an alert attorney took a closer look and saw the makings of a product liability case. 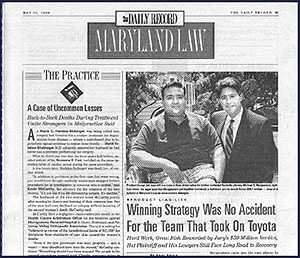 Three years later, when a panel of jurors in Baltimore got that case, they saw not only a head-on collision but a defective passenger seat and the manufacturer's failure to warn travelers about the dangers of riding in a reclining position. Last week, after deliberating for about three hours, the jury awarded Prashant Kumar of Bowie $59.7 million—none of it subject to Maryland's cap on noneconomic damages, since the accident occurred in New Jersey and the case was tried under New Jersey law. "The first thing was, I tried to get the cars, " said Michael S. Morgenstern of Rockville, the lawyer who put together Kumar's legal team. "And that wasn't easy because my client was a passenger in [someone else's] car," and the owner's insurance company didn't want to release the automobile. Morgenstern came into the case almost by chance: he knew the victim's younger brother, who called him while Kumar, a Bowie resident, still lay in a coma in the New Jersey hospital. The night of June 8, 1997, Kumar was riding in the front passenger seat of a 1996 Toyota Tercel driven by Marc E. Mallonee. Kumar was wearing his seat belt. His seat tilted back, in the reclining position. They were on New Jersey State Highway 40 when a 1987 Cadillac Cimarron, driven by Alfred C. Shumar of Bel Air, crossed the median. The cars hit with such a force that Shumar and his two passengers, none of whom wore seat belts, died from the collision with the Tercel. Kumar, 25, at the time, was pushed into the Tercel's footwell. His lungs were damaged, numerous bones were broken, and his legs had to be amputated—first below the knees, then, as complications such as gangrene set in, higher. Then, higher still. His legs now stop well above the knees, making the use of prosthetics much more difficult. His injuries shorten his life expectancy to age 50. Mallonee, driver of the tiny Toyota, walked way from the accident. Morgenstern, a personal injury attorney and member of a three-lawyer office, said it struck him as unusual that one person could be sitting "less than 12 inches from the other and walk away unharmed" while the other suffered extraordinary injuries. "The driver pushed open the door and got out. That was the red flag that indicated it was product liability case; that's when the bells went off," Morgenstern said. Ultimately, the case against Toyota rested on two grounds. The owner's manual of the Tercel said not to ride while the seat was reclined, but Kumar, a passenger, had no reason to look in the owner's manual. The warning was not posted on the inside of the car. Worse yet, the seat was designed so that it had to be rocked to lock into place after moving on its tracks. Again, there was no warning. "It would cost less than a dime" to remedy the problem, Morgenstern said. As he was investigating the case, Morgenstern recalled that Annapolis attorney Deborah L. Potter had put together a team of lawyers in a $26 million product liability case against Ford Motor Company some years ago, so he contacted Potter. "The lack of anti-siphoning device caused the gas to pour out the tank after the [head-on] collision and fed the fire," Potter said, speaking of the accident that caused John Wasilik to suffer burns so severe that he lost his right arm and right leg—"third-degree burns over 65 percent of his body." Potter recommended the Missouri attorney who had helped her. Morgenstern interviewed other lawyers around the country but he especially liked the ones Potter recommended, Robert L. Langdon and Kent Emison of Lexington, MO. "This is a small firm and very selective in cases they take," Morgenstern said. Langdon and Emison inspected the accident scene and considered the underlying circumstances. "The twist on this case was that the seat track went forward" because it didn't catch, Langdon said. Auto manufacturers routinely build that looseness into seats so they will wiggle into the track. "It was like being on a sled that was slamming forward, " Langdon said. But the team still had some open slots. Langdon and Emison had worked with veteran litigator Paul D. Bekman on the Wasilik case after Ford appealed. Morgenstern knew of Bekman as a former president of the Maryland Trial Lawyers Association. Beckman and Stuart M. Salsbury, partners in the 10 attorney Isrealson, Salsbury, Clements, & Bekman, joined the team , and their offices near the court house became its "war room." The legal team "took hundreds and hundreds of photographs" of the cars and the accident site, and sent the cars to a Texas accident reconstruction specialist for examination, Morgenstern said. "The amount of work before filing the law suit was enormous." What Salsbury calls the "David and Goliath" aspect of the case was accented, at times, but the fact that they were dealing not only with a huge manufacturer but also with a huge, foreign manufacturer. "[One] document was produced in Japanese, and we had the document in English from Toyota, but Toyota wouldn't stipulate that it was the same document," Bekman recalled. "We had to hire a Japanese interpreter who translated it," and Toyota stipulated to that translation. Salsbury and Bekman estimate their firm has incurred "hundreds of thousands of dollars in expenses," which they would not recoup unless they won. "These are very, very, expensive cases to bring and to defend," Bekman said—and especially risky when, as here, the lawyers are working on a contingency basis. And it still may be a while before they see any of that $59.7 million. Toyota's attorneys at Piper, Marbury, Rudick & Wolfe declined to discuss the case and referred inquiries to Toyota Motor Corporation offices in California. As this article went to press, Toyota was "looking at post-trial motions and appeals," said John Hanson, Toyota's national product news manager. The automaker's options include asking the presiding judge, Circuit Court Judge John Carroll Byrnes, to reduce the award. Hanson said that the most Toyota could owe under New Jersey law is $17.0 million, but Bekman put the figure substantially higher: $10 million to compensate Kumar of his losses plus 30 percent of the $50 million pain and suffering award, for a total of $25 million. Toyota's share of the liability is especially important because of the remainder of the verdict, more than $30 million, is against Shumar's estate and Kumar's attorney's said that he has few assets. "This is just the beginning," Salsbury said of the victory, as he recalled two product liability cases that he tried lasted 11 years each. "One went up on four appeals." Kumar, who was looking to open an import-export business when misfortune struck, begs people to learn from his tragedy. "Here I was, my legs missing," he said this week of the trauma that lingers. "My girlfriend left me. My buddies, the friends that I was closest to, they left me. It's not that they're bad people, they just couldn't deal with it." On his way to yet another physical therapy session, Kumar has a final word for the automakers. "The message has to be made to Toyota and all manufacturers: Please, please tell people the danger of reclining seats...while the car is in motion. I don't want anybody to ever, ever go through what I went through."